15 December 2017 -The Guardian. 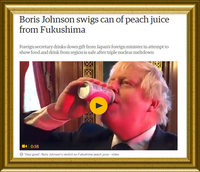 UK Secretary of State for Foreign and Commonwealth Affairs Boris Johnson drinks Peach Juice. In this conversation, Gunderson reveals some important information using the results of his own collection and testing of samples. I found his honesty quite shocking given the controversy and criticism he generates regarding his own motivations, loyalties & intent. Another knock-out blow is delivered to the situation as Russia lifts restrictions on Food Produced in the Prefectures around the plant. Surely a hammer blow and final nail in the coffin for the North Pacific's wild life who, now so entombed in Humanities denial, has no chances left to it and no hope of respite at all. Dana Durnford 2018....Making War on Troubled seas again. At last! 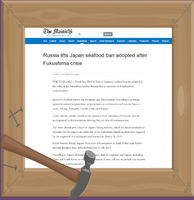 They have thoroughly tested Tuna and found too much Zinc.